Heroes, Heroines, and History: Tidbits About Cotuit, MA. Cotuit is one of the hidden places on Cape Cod, it’s off the main road and you wouldn’t think there was a village there because most of the streets going into it, look like residential streets. I selected Cotuit because of a family connection to the location and decided to have my hero from my next novel hail from there. So, let me share a few little tidbits I know about this place. First, it was known as Cotuit Port until 1872 when the name changed and Port was removed from the name. The harbor is what you call a natural harbor. The reason for this is that it is protected by jutting spits of land on both sides of the entrance into the harbor, which any seaman will tell you is very nice to protect your boat. So being a coastal town people made their livings mostly from the sea. Seamen, Fishermen, Ship Builders, Captains, Whalers, Steam engine engineers and even some crafty smugglers have made their home in Cotuit. 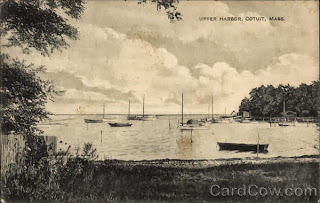 (The picture on your right comes from one I found on the internet at Card Cow and printed on the card it says it's of the upper harbor of Cotuit harbor. Below is a series of 7 pictures I took of Cotuit Harbor a couple years ago. Catboats were one of the boats built there. 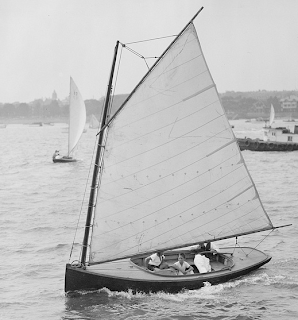 A Catboat is unique to the Cape and has a low draw with a forward mast which were helpful for fisherman in the area. Today a Catboat is strictly a pleasure craft. Here’s an example of a Catboat. Cranberries grow in the marshes and Oysters are plentiful in the harbor. Cotuit Oysters are not as plentiful as they once were but are known for their unique ‘sweet’ taste. In the mid 1800’s Cotuit was discovered as a place to build a summer residence. My husband’s ancestors owned the first Inn, The Santuit House, built by Braddock Coleman in 1860. It was the first hotel on the Cape. Cotuit also has another first distinction and that is Union Church where the members combined three churches of various faiths and built one Community based church in 1846. It was the first community church in America. One of my in-laws favorite novelist was Joseph C. Lincoln who set many of his stories on Cape Cod. To them it brought back memories of childhood and many of the characters he wrote about they saw in people they knew as children. If you’re ever looking for something to read with that old character charm I highly recommend Lincoln’s novels. Pictured on the left is the Anna B. Heidritter the last four-masted cargo schooner on the East Coast, it was manned by Captain Bennett Coleman who was born in Cotuit. Bennett's home, pictured below is fairly typical for some of the larger homes in the area. As I mentioned the village of Cotuit roots are in the sea. And I grew up on Martha's Vineyard not too far from Cotuit by the way a sea gull. It was fun searching for the pictures from my trip and difficult to limit to just a few. If you're ever on the Cape, take the time to find this hidden treasure. Don't forget to stop in to the general store and the historical society. And if your imagination runs wild visiting old cemeteries, you'll want to stop by the one in Cotuit. There are a lot of old stones there, some have been lost over the years but there are some great lines captured on these stones, giving you a glimpse of some of the people who have gone before us. You're welcome. The Inn that my husband's family owned actually burned down at the end of the century. A new one was rebuilt by an ancestor. However, I do not know the status of that building. great article, I am just researching my father's family that lived in Marstons Mills, MA and always heard the story about my great grandfather John Ambrose Coleman's brother who was a sea captain and died in a taxi accident in NJ...so in the past two days found articles and now pictures of his ship...I am thrilled with this new found information..
Hi Dotty, That's exciting. So, you and my husband are distantly related. Paul's grandfather was Donald Coleman, Bennett's son and I have pictures of the ship and family events held on the ship. Paul's father, David was a teen in one of those pictures. Bennet's father's name was Francis B. Coleman. We can email other details if you would like.